Gaithersburg apartments in Maryland offer comfort and convenience in a historic business center. 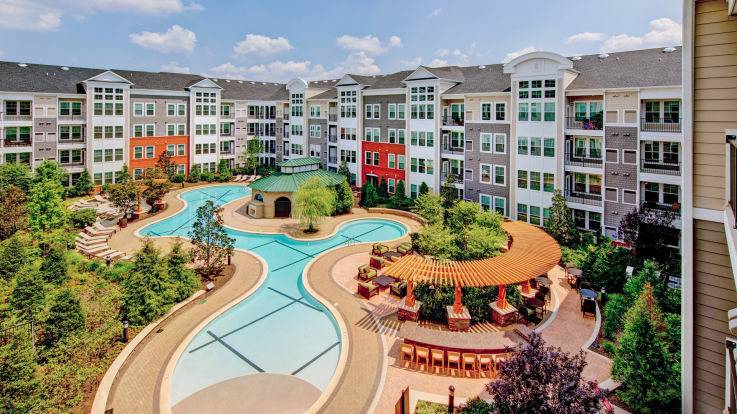 Incorporated in 1878, Gaithersburg, MD enjoys the benefits of inclusion in the Washington-Arlington-Alexandria Metropolitan area and Equity Properties offers a selection of amenities that further benefit its residents. Residents of these communities enjoy smoke-free living in the heart of lively Gaithersburg. Enjoy apartment living with the shopping and various activities at the Lakeforest Mall and the Montgomery County Fairgrounds. Even though the bus to DC’s Shady Grove Metro Station is easily accessible, there are many reasons to stay near Gaithersburg apartments to enjoy a night out. Olde Towne Gaithersburg, a historical center, includes cafes, restaurants, and boutique shopping. Nearby breweries, Growlers Brew Pub and café Java Junction draw are perfect places to unwind after a long day at work. Apartment living in Gaithersburg is ideal because so many employers are in close proximity. Gaithersburg is the home of the United States Army Reserve’s 220th Military Police Brigade, and the National Institute of Standards and Technology, making the area lively and busy. With several major domestic and international employers in Gaithersburg, Equity blends culture and comfort for busy, active residents. MARC public transit station is directly across the street from the community, and all of the historic and cultural destinations in DC are simply a short train ride away. apartments are an oasis of relaxation in a busy metropolitan area. Residents can change the temperature as they wish in their apartment home since each community features individual air conditioning and temperature controls. Walk-in closets, built-in bookshelves, and computer nooks help residents to maintain an organized, lifestyle in comfort and ease. When residents are not enjoying the island kitchens, microwaves, dishwashers, and breakfast bar/room in their spacious homes, they can access the outdoor amenities that contribute to an active, social lifestyle. Although features vary by apartment, the outdoor barbecue grill, picnic area, clubhouse and swimming pool are accessible to all residents. It is easy to stay fit and active in Gaithersburg – when it’s cold outside or when time is of the essence, the indoor Fitness Center will be open. Experience the perks of the Washington-Arlington-Alexandria Metropolitan area with the charm of Gaithersburg. Take a tour of an Equity Property and see how modern comforts and old world charm blend into one splendid community.